I took the plunge. 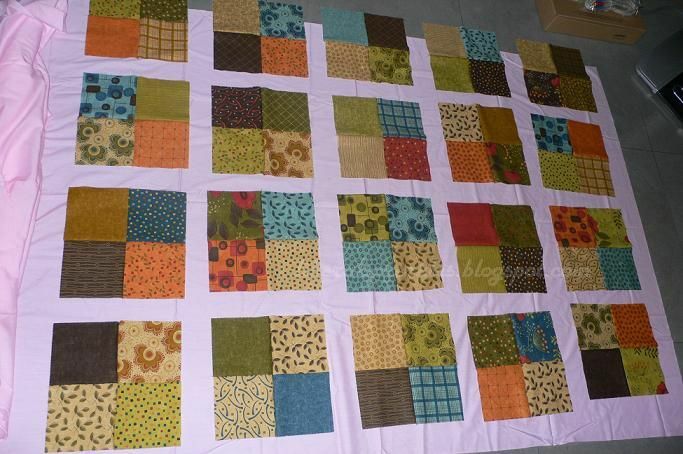 I'm making my first quilt! I've been thinking about doing it for a while but I've never tackled such a big sewing project (the biggest thing I've ever sewn are bags), I've been sewing for only a year and a half, I'm a very slow sewer and I don't always sew straight! I'm also very impatient and easily distracted. I have 3 bag projects that I started about a year ago but haven't finished. I just get excited by other ideas, sewing and otherwise. 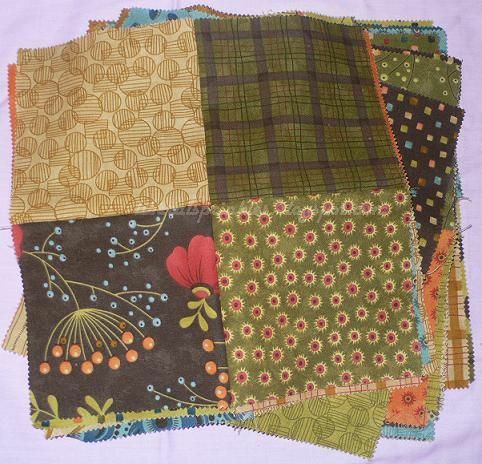 But I wanted to try making a quilt this year. I was tempted to join a quilt-along but that Dresden circle would have been a crazy project for a beginner. Best to start with something easy and which doesn't require a lot of measuring and cutting (my most hated part about sewing). Pre-cuts! I decided on charm squares. I'm hopeless at reading patterns and following directions, so I'm winging it as I go along. I got two of these for US$8 last year at Some Art Fabric! They sometimes have 2-for1 offers and I got some really great deals there. I did some math (I hate math) and figured I could get a sort of twin-sized quilt out of 20 blocks of 4 charms (I will soon find out how crazy I go trying to manoeuver the whole quilt around my sewing machine!). That's me trying to decide what goes where. I didn't have enough floor space so I did one charm pack first, then the other blocks (that lone square in the bottom right corner was an extra in the first pack I opened :) I spent quite a bit of time on my knees, I had fun moving those squares around, visualizing what my finished quilt would look like. Imagine if I hadn't used a charm pack. I would never have gotten to the sewing stage! organized ... so very un-me! All arranged, organized and ready to go. 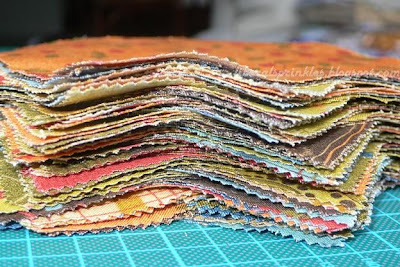 I took a lot of photos of this stack from different angles, I just love looking at fabric and the pinked edges are so cute! The block on top is my first ever quilt block!! I sewed pretty straight this time! I can't put into words how excited I was when I finished that block. And when I finished all 20, wow. Satisfaction! I poured myself a drink ... heheh. I moved some furniture around so I had enough space to audition fabric for the sashing. This took me forever. I tried more than five solids but didn't find anything that really struck me immediately as IT but since I want to use only fabric from my stash, I settled on a green. 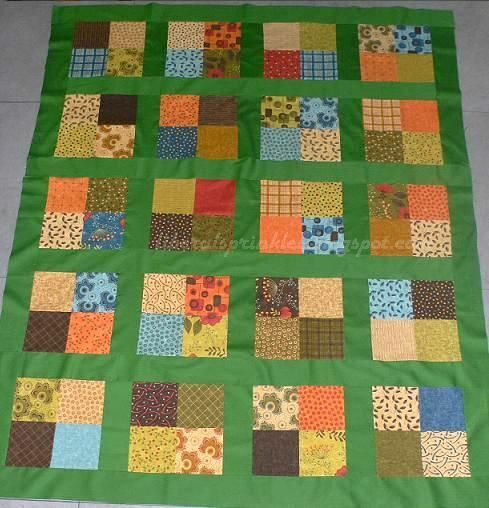 I would have liked a yellow sashing and green border but I don't have any yellow solids. I think I'll use the pink in the photo above for the border (? any thoughts on this?) but I have no idea what fabric I'll be using for the binding and the back, though I'll probably sew the remaining squares into one long strip. I haven't counted to see if they'll run down the length of the quilt. I probably should have chosen all my fabrics and done all the math right at the start but I'm not very organized! If you're a quilter and you're appalled at how I'm going about this...sorry! Dealing with the project in stages makes it less intimidating for me. When I try reading patterns, I give up before I get to the end or figure out how everything would come together. I also like to improvise as I go along, it allows me room to manoeuver. But it can get me in trouble. 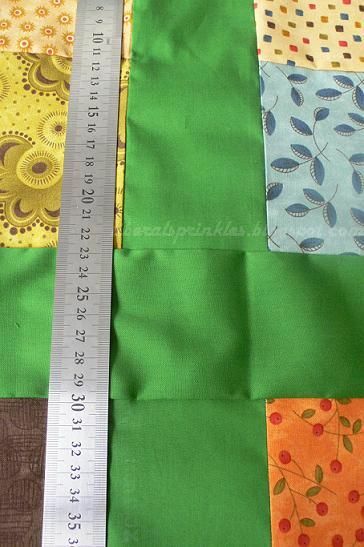 I had already cut into my green sashing fabric before I realized that I wouldn't have enough to cut the side strips in one complete length. Oops. time to rip it up! And I spoke too soon, I didn't sew quite straight! Should I, should I not? I knew I should take it apart but I'm very lazy and I hate ripping seams although I seem to do it a lot. OK, I gave in, turned on the TV and started ripping. I'd sewed in very small stitches so that took a long time too. I took 2 sections apart. The resewing was fast, but I had to rip one up again because it just wasn't right. One other thing I hate: ironing. I really did iron after piecing each part; I don't know why it doesn't look it though... Sewing has reintroduced me to ironing. I've ironed my clothes maybe twice a year in the last 3 years! Next week: border and charm square strip for the back? Meanwhile, I'm watching some quilting videos at YouTube for inspiration. Free motion quilting is amazing, maybe I'll get there one day. I'm aiming for just straight line quilting for now. If you haven't seen the works of Judi Madsen, check out the incredible eye candy at Green Fairy Quilts. Her quilting is exquisite, I'm a big fan. 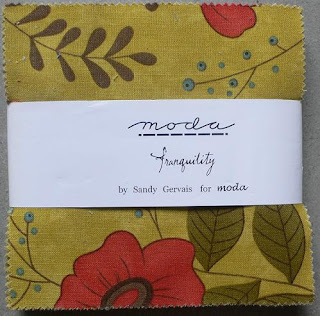 You can also get Moda pre-cuts at nice prices at her store. ComfortHouse.com-Products to Make Life More Comfortable and International Shipping too! Click here! Thanks for hosting the parties, ladies. Please click on the button to see more goodies. very nice! congrats on your first. I'm not much of a seamstress, and I'd be terrified to try a quilt. I did make valances for my living room and dining room last year. Mostly, though, my sewing consists of mending things. :) The quilt is lovely! Please come see my Blues, have a nice day! So much work; I've never made a quilt. Thanks for sharing your blues. Your quilt turned out so cheerful and beautiful! Great and wonderful job and an awesome detailed post, as always. I would have never thought about looking on You Tube for tutorials. I don't like to cut and use pins myself, if I don't have too. 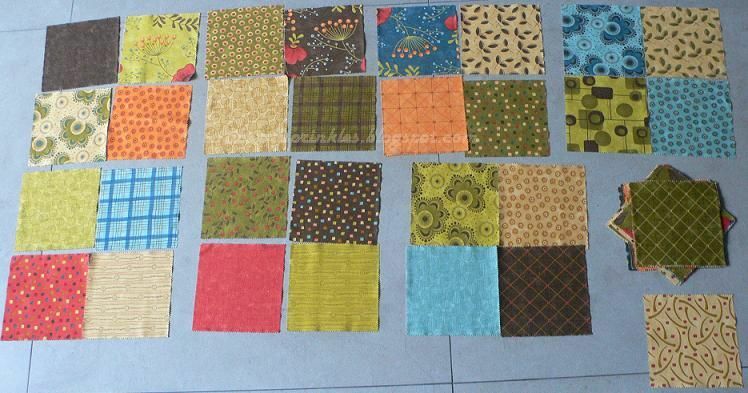 I tell people that I specialize in sewing squares and rectangles. Have you seen my "Crafts" blog? There are a few tutorials on there for making easy pillows. Have a great week, and thanks so much for your post. Happy Blue Monday too! Dear Gina, goodie I won't have to look out for the quilt police! Kathy, there's a lot of great stuff on You Tube, and I find video tutorials so much easier to follow than written ones (especially those with no photos!). I don't like to cut and measure, it takes me nearly as long as the sewing! But I always use pins now, I had a lot of disasters in the beginning when I tried to do without them! I'll check out your crafts blog, thanks for the heads up! congrats on your first quilt! watch out, though, they're like Pringles... you can't stop with just one! Congrats on your first quilt! Don't feel bad about things not being perfect, I always have mistakes, and if it isn't to big of a deal, sometimes I just leave them in! I hate ironing too, so I feel your pain! Lovely quilt and lovely blue pieces. Really nice! Congratulations on your first of many quilts! Keep blogging and looking and you will have such fun and meet so many nice people! First quilt! You did a great job. Congratulations! I like the green sashing. congrats on accomplishing your first quilt top!! I know exactly how it feels!! I just finished my second quilt a couple of weeks ago..how exciting!! You probably know about the Moda Bake Shop, but just in case you don't, they have a lot of great tutorials!! Welcome to the quilting world!! Loved reading about your quilt! I made my first ones by hand, hexagons and other shapes because the method of working suited my life at the time. One of my most successful was made in a weekend as therapy after dealing with an especially horrible colleague. I have to make another quilt within the next year or so because grand-daughter no.1 has one and it's only fair that grand-daughter no.2 has one also. my original photos and blog content are protected by copyright, i reserve all rights on them. please request permission if you'd like to use something you found here. 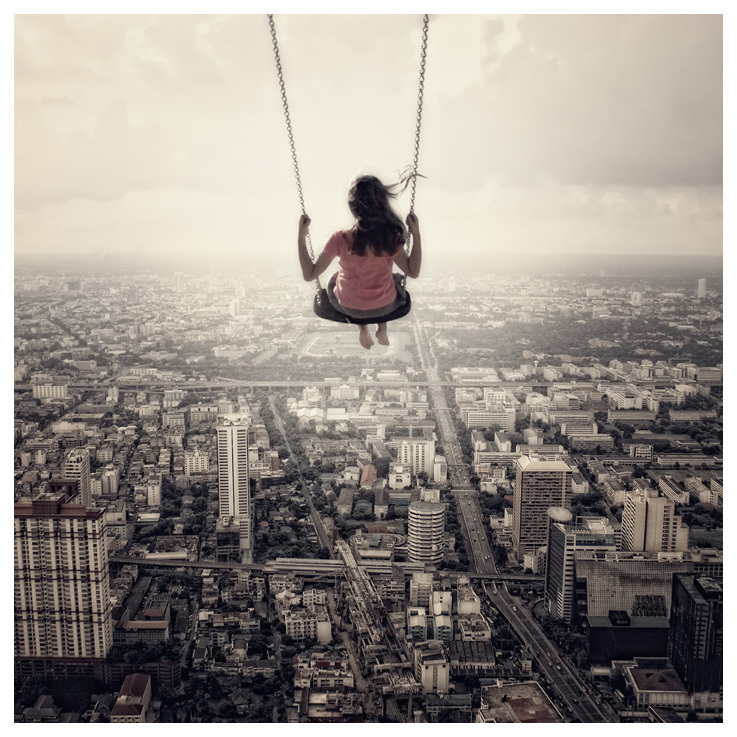 thank you for crediting & linking back to this blog!